SBM equipment will be demo'd for attendees. Customers will have a chance to meet with representatives from Allied, SBM, Rotar, Epiroc and Rubble Master and a range of equipment will be on display and demo'd. Dave Rock, operations manager, Terrafirma Equipment: "We wanted to host this event as a thank you to our customers for all their years of business. It will also give them a chance to learn more about our wide range of heavy equipment and attachments. Our inventory will be on display and we plan on demonstrating equipment such as the SBM Remax 500 Crusher and RM 90G0! Crusher. Our vendor representatives [SBM, Rubble Master, Allied, Epiroc (Atlas Copco) and Rotar] will also be there to meet with customers and provide further information on their product range. Erich had built Terrafirma Equipment into a trusted company for over the past 50 years and we still intend to remain dedicated to our customers. We would like our customers to meet the team who will be leading Terrafirma Equipment in the many years to come. We really appreciate our customers and hope they can come out to enjoy the day with us." These products and more will be on display at Terrafirma's customer appreciation event. The Remax 500 from SBM Mineral Processing is a latest technology, diesel-over-electric or 100 percent electrically driven, efficient and powerful impact crusher that tackles nearly any application and job size. The still-small footprint makes this crusher a breeze to transport, and it fits into tight areas, too. Due to its powerful 400-KvA gen set, 1,300-mm crusher, two-deck square mesh pre-screen, discharge feeder pan and two-deck final screen it does not fall short in its ability to process both natural rock and recycling materials into a cubical shaped final product. The operation of the Remax 500 is safe and easy as well, with a touchscreen display and wireless remote control functions. You can even check in on the Remax's operation from any PC computer connected to the internet by using remote access monitoring. It has a 8-cubic-metre hopper, over-belt magnetic separator, wind sifter for light fractions, and two-deck banana-shaped screen with return belt. Optimized material flow is assured due to the integrated two-deck pre-screening unit with lateral discharge conveyor, the aggressive intake geometry, and the vibrating discharge chute below the impact crusher for especially gentle transfer to the main discharge conveyor. In addition, the company says that an eco-friendly diesel-over-electric drive with optional external power supply makes the SBM Remax 500 crusher a leader in environmentally friendly and cost-efficient crushing and screening technology. 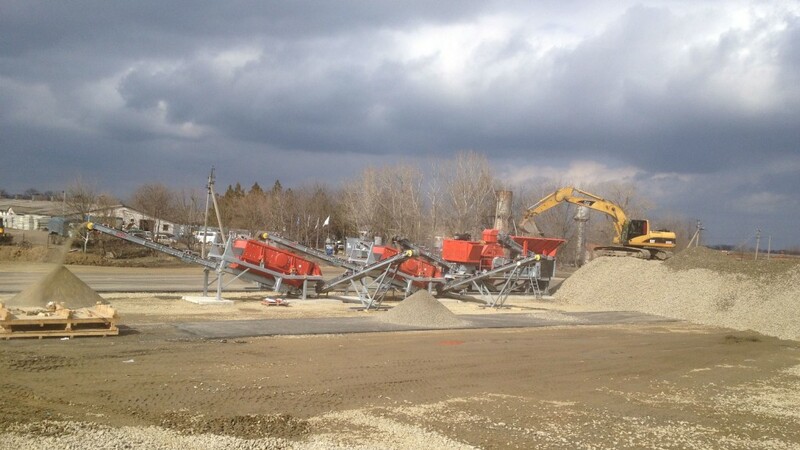 The HS7500M is a durable, robust and high-performance track-mounted scalping screen for a wide range of heavy-duty applications including bulky C&D waste, shot-rock, gravel, millings, crushed materials and many more. This track-mounted scalping screen features a fully adjustable 16- x 5-foot screen box, wide chutes for efficient material flow, and weighs just 66,000 pounds. With an unlimited combination of punch plates and wire cloth, the HS7500M is the perfect machine for any screening application. On display will be Antraquip's rock and concrete grinders which are suitable for trenching, controlled demolition, scaling, soil remediation, tunnelling, underwater cutting and general rock excavation. Numerous models are available for excavators ranging from 2 to 110 tons. Antraquip offers a choice of cutter head styles to suit the application. The AQ line is equipped with a high-torque, low-speed hydraulic motor with rugged gearing and symmetrically aligned cutter bit patterns for maximum productivity.